Truly Polished: Versatile Blogger Award!!! Hi guys, hope you're all having a lovely day! I've been so busy today, my baby is such a handful these days, he's so active and we're trying to pack for our holiday! We're going to Malta tomorrow so this is all very last minute! 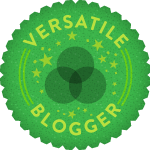 Anyway, I've just received my second nomination for the Versatile Blogger Award! Crystal from Crys Loves Polish nominated me a couple of weeks ago, and now Apple from Apple Drops has nominated me! Thank you so much both of you! I started this blog as a way to get my passion out there and it means so much to me that people come to my page and read my blog! I really hope you guys enjoy reading it half as much as I enjoy writing it! 1. Nominate 15 fellow bloggers that are relatively new to blogging. 2. Let them know you have nominated them. 4. Thank the blogger(s) who nominated you. Find my seven random facts after the jump! 1. I have a little boy, his name is Caleb, he's already the most amazing thing ever and he's only six and a half months old! 2. I studied law for three years at uni, came out with a 2:1 Honours degree, but I have no interest in becoming a lawyer... In fact, my dream job would be a scientist! I'd love to be an astronomer or an astrophysicist! 3. Leading on from point 2, I LOVE ASTRONOMY! I have a telescope, books on the Cosmos, and I hope that one day I'll have a tracker telescope and a long exposure camera to take really bright and colourful photos of nebulae... Okay, enough of that! 4. I was a vegetarian for 8 years, but I have started eating meat again because I was dangerously anaemic and generally unhealthy, now I love chicken wings! 5. Cheese is hands down my favourite food. 6. I lived in Valencia, Spain for 5 years and speak fluent Spanish. 7. I really want to start my own line of nail polish, I'm just waiting for the right time! I hope you enjoyed this post! I have some Cult Nails nail mail to show you later, yes, more nail mail! This is from their $5 sale! So stay tuned! I also have a little giveaway to announce, won't be happening for a while though! Thank you so much Faye! I'm going to check out the other blogs you mentioned right now! Congrats on your award!